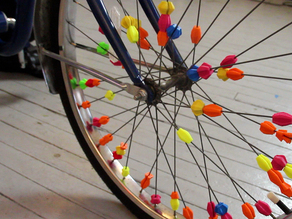 Bike has 32 spokes per wheel... Printed 36 beads of each design in green GITD. Good fit on the spokes. Cool! Update: Friend loved these and even found a second use for them... snap onto their camping tent stake lines so that they don't trip over the lines in the dark... the beads GITD enough to seem then when walking around a dark campsite. Also requested more in bright colors beads for daytime display on the tent lines, so printed a set of 12 tall ones again at 90%. (Smaller cutout fit the tent lines better.) Most Excellent!